Daily Magic Productions proudly presents the newest addition to the Ominous Objects series! You've been summoned by a duchess to help her husband the duke. He's become increasingly obsessed with collecting a set of historical armor. But his interest takes a deadly turn when the armors' previous owners return from the dead to finish what they began centuries ago, putting the whole city in danger! Solve the case with your fluffy companion Mr. Jenkins in this intriguing hidden-object puzzle adventure game! 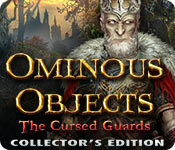 Ominous Objects: The Cursed Guards Collector's Edition is rated 3.3 out of 5 by 30. Rated 5 out of 5 by Snowview from worth buying the collector's edition I rarely buy CEs because I usually don't enjoy finding extra objects that much, but this game was an exception with the morphing cats and cards. I loved the royal family--if there was one thing I'd change it would be more interactions with friends and less with enemies. I got so involved in the story didn't want to stop playing. Beautiful, spooky, dark scenes but not too dark. Probably the best part was the plentiful M3s I could play instead of finding objects. Rated 5 out of 5 by skullfun from Ominous Ojects 5 is a great edition to this popular series! Fantasy stories usually involve a lot of ludicrous concepts, but then again that’s why they are called “fantasy.” I think people enjoy adventures that involve knights, dragons and magic spells, especially when the good guys manage to save the day in the end. HOPA games are a great way for fantasy buffs to play an active part in such stories, which is why they are so beloved. Daily Magic's latest adventure (5th in the series) is a hidden object adventure game that allows you to go on a great journey and deal with evil ghosts while you are it. You play the role of a detective named Leia. The story revolves around a duke who’s trying to collect every piece of a legendary armor set, except that the said armor belonged to people who are now coming back from the death for it. Things really get interesting when you learn that the insane King Frieder has summoned his Knights (the cursed guards) from the grave to aid in his evil plan. Two ancient relics must be found and placed where (the cursed guards) died in order to revive them. Beware of the Black Knight when you reach that part of the adventure. He is a force to behold and you must stop him. Naturally, Leia is in charge of investigating the mystery in question, and you are not alone. Leia has Mr. Jenkins to lend a paw with the investigation, which comes in handy when you need to reach into tight spots. The actual riddles usually require you to find a few objects before they can be solved, after which you have to take on the actual puzzles. Most of them are about finding the right pattern and applying it a couple of times, but there are more original ideas at work too. In addition, Mr. Jenkins the cat is integrated quite well into the whole thing, even if it’s very obvious when the kitty comes in handy. Mr. Jenkins is in every edition of Ominous Objects and I never tire of utilizing his help and I'm not a cat lover. LOL. As far as the graphics are concerned, you can rest assured that everything looks as dreamy as you might imagine. Each landscape is unique and very detailed, making it very easy to get into the proper mood for the story. Even the cut-scenes are nicely done, and the special effects added on top work like a charm as well. Lastly, the soundtrack is not bad either, and the voice acting is really believable. 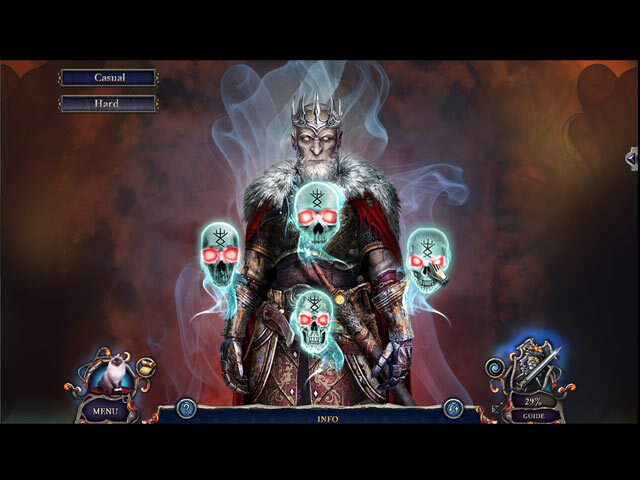 Ominous Objects: The Cursed Guards is not overly original in terms of gameplay, but it has the necessary elements to keep you busy for a long time. On top of that, this edition is a memorable adventure with a great story interesting enough to be worth a complete play through as well. Some Ominous Object adventures are better than others, I happen to enjoy the ENTIRE SERIES. Demo this one to see if you will like this edition, it really is one of the better installments. Cheers! Rated 5 out of 5 by Gamingpip from Oh How I Love This Game I've been starving for a hard game and Ominous Objects finally came around!. I really appreciate the developer allowing for the icon changes to be turned off. A game has to have some exceptional qualities before I will buy it with those stupid little magnifying glasses and gears. In this case, the game has some new types of interactions that I really enjoyed. I bought it as soon as the first walk on the log bridge showed up. Thank you Daily Magic for giving something different and interesting. Rated 5 out of 5 by Aint_B from Had To Have It! I bought this game before the trial time was over. The puzzles were different from other games. Loved what I've played so far! Can't wait to get back to the game! Rated 5 out of 5 by pennmom36 from DEATHLESS KNIGHTS RISE FROM THE GRAVE (this is never a good thing) A King driven by madness, commissions four enchanted armors for his most trusted knight warriors. The Deathless Knights ensued corruption, as they spread panic and chaos throughout the Kingdom, becoming an unstoppable force of evil. Their reign ended when a young Prince with a pure heart, (exactly what constitutes a pure heart in the year 1546?) defeated the four Horsemen and scattered their apocalyptic cursed armor to the four corners of Earth, to ensure their fury would never reunite. Ahh, but never doesn't last forever, and Leia's paranormal ability to see Ominous Objects will be put to the test, as she tries to save the Duke of Braunschweig and his freshly coronated son from certain death. The Deathless Knights of darkness have returned from the grave! I'm not a huge fan of the Ominous Objects series, which has had several duds lately. 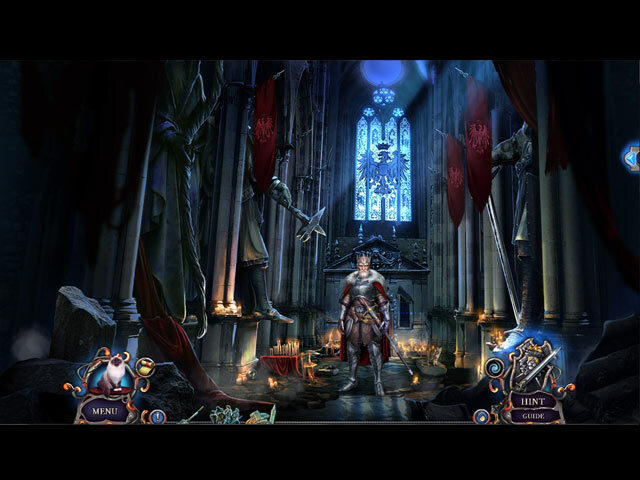 But The Cursed Guards, might just be this series saving grace, it's not epic, but it is a pretty good game. The graphics are fantastic, the storyline is interesting, and Mr. Jenkins is once again the star of the show. In this Collector's Edition version, there are 14 Collectible Playing Cards, and 40 Morphing Cat Objects, that aren't that hard to find because all you have to do is look for a cat, but at least the cursor doesn't change to a hand to make it impossible not to find. There aren't a whole lot of Achievements to earn BUT, Daily Magic has added a fantastic Easter Egg feature, so read the available Achievements before playing the game, and use the clues given to find your eggs! 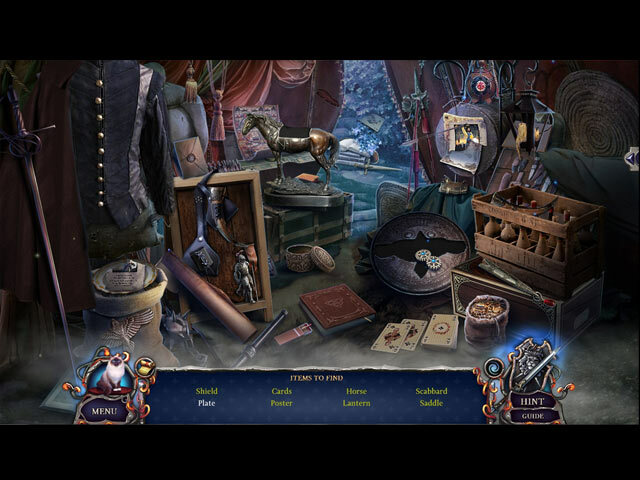 The Hidden Object Scenes are really good, I normally don't get all that impressed by HOP's because they are usually so easy that I can find the items without looking at the list. Not so with these, my favorite was the scene where you find objects hidden within a statue on a wall, and the items are so creatively blended, that it was actually fun! There is an alternate Match 3 game as well. The Mini Games are good, but are little too easy and simplistic for the most part, even on the "Hard" difficulty mode. Below are brief descriptions of some of the games you'll encounter during the demo: 1) Maintain your balance using directional arrows. 2) Use directional arrows to rotate a disc maze to complete a path for the chips to travel. 3) Find and replace missing picture pieces. 4) Untangle a rope starting at the end, in the correct order. 5) Interact with a stage play by selecting specific available tabs. 6) Place all the various shaped pieces on the board so they all fit together. 7) Rotate disks to complete a picture. 8) Assemble map fragments correctly. 9) Select swords in a specific order, moving one sword may affect others. This Collector's Edition has 6 Wallpapers, 10 Concept Art pictures, 4 Music Soundtracks, a game of Dots, 3 Developer's Diary pictures, 11 Achievements (with Easter Eggs!) 14 Collectible Playing Cards, 40 Morphing Cats, a built in Strategy Guide and a Bonus Chapter, enjoy! Rated 5 out of 5 by Anangelsprayer from Mr. Jenkins, your assistance is required Another wonderful game by this team with the beloved cat Mr. Jenkins (I love this cat). First I would like to say that Mr. Jenkins doesn't meow at all. He just sits there quietly grooming himself. The VO's are done superbly. Over all game play is just fun. The collectibles are guards (which are morphing cats) and playing cards. Click on the Morph swirl and you see the morphs turn into a puzzle pieces where you can complete a jigsaw puzzle. I truly enjoyed the demo and am looking forward to the full version. Story: Legend has it that the when the king was on his death bed he gave his most four trusted knights the armor. The armor was encrypted with dark magic and it took a knight with a pure to defeat the knights, and the armor was spread to different corners of the earth. But the duchess's hubby is obsessed with these armors. He doesn't realize if these four armors get together, it'll wreak havoc on the world. This is why the duchess called Leia to stop her hubby. Graphics: Awesome. I noticed quite a bit of 3D graphics which are truly different. I just looked at the scenery before continuing. Music: Fits beautifully with the game. H0GS: Different variety and fun. A lot of interaction. Mini games: You get a choice of Casual or Hard mode. The one is a balancing act where you have to have Leia walk across a log. Even on casual this one is quite a challenge. I eventually got her across, but it took a bit. Maze puzzle, move the two halves of the medallion along the paths which rotate to the center. Another was put the pieces of the picture back where they belong. I didn't get farther cause I stopped and bought the game. Map: Shows you objectives and where you can do something. It's a jump map. All in all I love this game. The Ominous Objects series is one of my favorite series. Not only for the awesome game play and beautiful scenery, Mr. Jenkins is a love bug, and Leia has a great sense of humor, and is a pleasure to "work" with. Kudos to the team, and thank you. I highly recommend this game. Rated 5 out of 5 by biscuitsmama from CAN YOU DEFEAT THE CURSED GUARDS AND RESTORE PEACE TO THE KINGDOM? Our Ominous Objects investigator, Leia is back along with her furball buddy Mr. Jenkins. There is foul magic afoot in the Cursed Guards as the retired Duke of Braunschweig obviously has too much time on his hands and has indulged in an obsessive search for some cursed armor that was long ago created by a deranged and evil king. It is said that the king had four sets of armor created that were imbued with evil magic and then gave them to his four loyal champions to control his kingdom after his death. A good knight who was pure of heart managed to destroy the evil knights and had their cursed armor buried in different locations, thus putting an end to the reign of evil terror and restoring peace to the kingdom. Having found the missing armor, the old Duke has now released terror once again in the realm. It now becomes your task Miss Leia to destroy the risen knights and save the kingdom. Great graphics and sound along with some fun gameplay make this game a keeper for me. Even though I am not a huge fan of pet helpers in games, Ominous Objects simply wouldn’t be the same without our feisty feline helper. Fortunately, Mr. Jenkins is not used overmuch in the game and when he is; his antics are endearing and entertaining. Your tools (aside from Mr. Jenkins) include an integrated map found early in the game that will help you navigate quickly to areas where you have available tasks. The HOP scenes are nothing new but some are creative. I’m not a huge fan of the storybook scenes and there is one that I found very difficult as the items to be found were almost invisible. I must have used the dreaded hint button four or five times to make it through that particular scene and found it to be extremely tedious and irritating. I wish that developers would stop trying to make scenes more difficult by using a flat monotone palette. Many gamers are older and this type of scene becomes frustrating rather than fun. My eyes are very good and I still struggled to find items hidden on that misty gray statue. On the other hand, I found the puzzles entertaining and very enjoyable; with none being too difficult but at the same time adding to the storyline and gameplay fun. If you happen to prefer the CE version of a game, this one includes Collectible Cards and Morphing Objects hidden throughout the game. Achievements to earn, Wallpapers, Concept Artwork, Music, a Dots Game, Developers Diary, Bonus Chapter, and Strategy Guide. Since playing the beta for the game last year, I have been waiting for the full game to be released. The Cursed Guards seems as if it might be one of the best games in the Ominous Objects series. I happened to enjoy the game’s beta and hated to see it end. It is now my mission to put an end to the evil knights and stop their long-buried king from ever gaining power. I know the theme is fairly much the same but I am an avowed HOPA addict and love playing each new game. There will be cries from those who say “same ole, same ole” but my response is, if you feel that way, why bother? The premise for HOPAs is always the same – find objects, use them and save someone or something, with a storyline thrown in for good measure. The storyline as it develops is very good in the Cursed Guards and by the end of the demo I wanted more so the game became an instant buy for me. Yes, I buy a lot of games but they are my form of entertainment so I have a huge gaming library. Even though I really find this game excellent and enjoyable, as always, please try the demo to see if Cursed Guards is a game you will enjoy as well. Rated 4 out of 5 by Kay_Erin from A Sudden Death! As in most of my reviews,I will leave to others the breakdown of the game into hos, morphing objects etc. I'll just give you my basic reaction to the game. I liked it quite a bit. The story was sort of rambling, but that is fine with my liking for adventure and wandering about in mystic realms. The art work was a bit elaborate, (check out the Guards armor!) but that added to the fun. Hos were varied, so I didn't get bored. I like collecting objects throughout a game, so it was fun finding all the morphing cats. But I took off a star for not showing us how many we had got by the end of the game. After all I invested a lot of energy looking for those kitties! I like it best when the devs let us go back and find the missing ones. I'm almost sure I got most of them, but...we'll never know :( The bad guy gets it in the end in a very satisfactory manner (he was a VERY evil bad guy) and I liked the bonus chapter that showed us how that actually came to pass! All in all a pleasant game and lots of fun. As well, it will be fun to replay! Rated 4 out of 5 by wild_irish_rose from O This was great game and a great storyline. I've enjoyed the Ominous Objects series. Graphics were great and I loved the option of the match game. Only problem I had was in the match a number of pairs of items, the game locked up and I had to uninstall and reinstall the game. Could have been me or the game.